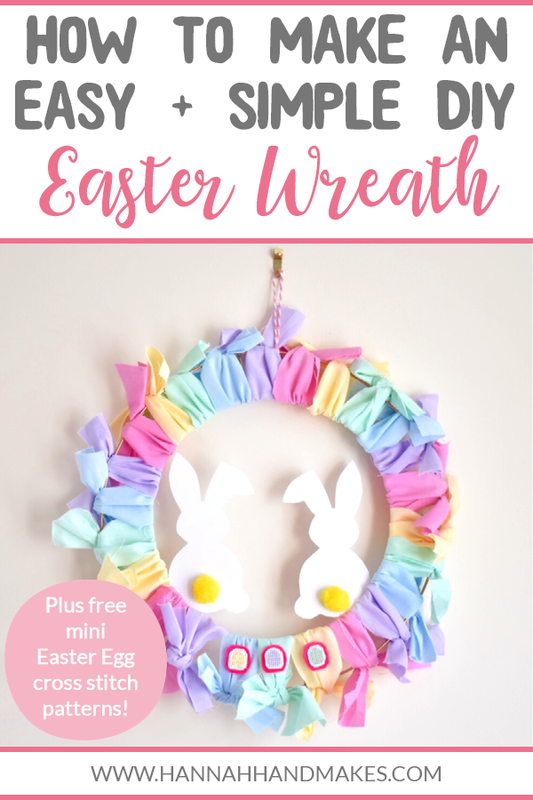 In this step-by-step tutorial I show you how to make an easy DIY Easter wreath that you can even make with the kids! 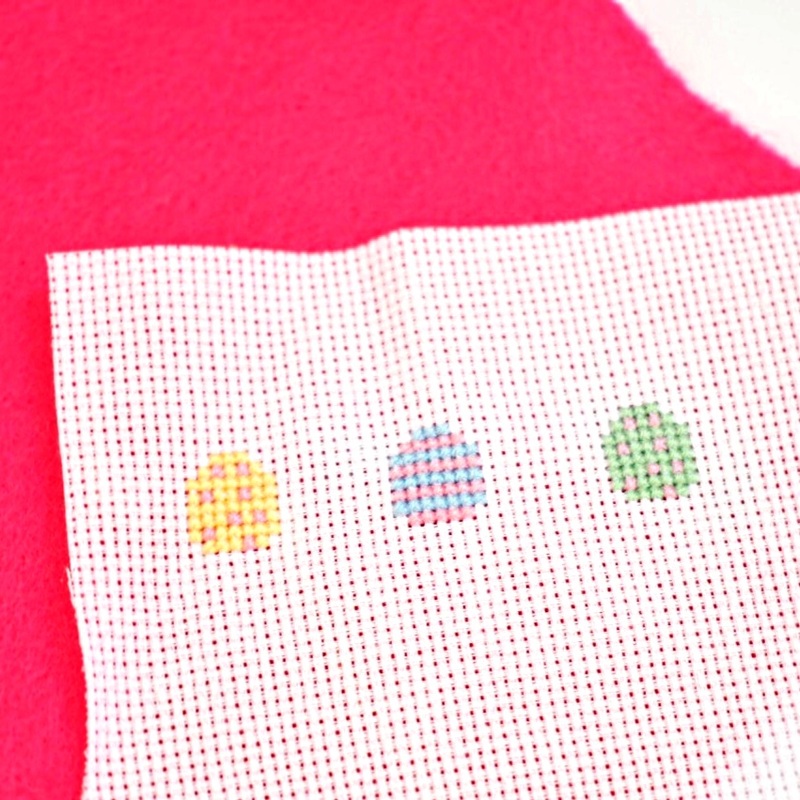 Using your free pattern, stitch as many small eggs as you would like to add onto your Easter wreath. I chose just 3, but you can add as many as you like! You can use aida or evenweave to stitch on and use 2 strands of thread. 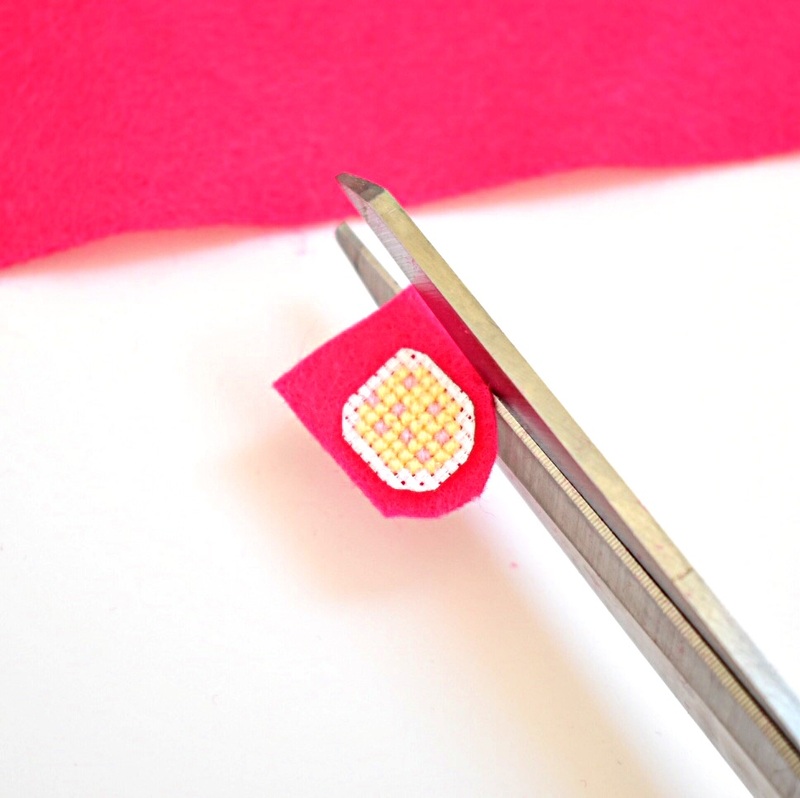 Once you have finished stitching them, cut them out leaving a small edge (about 1 square on your aida) around the edge of them. 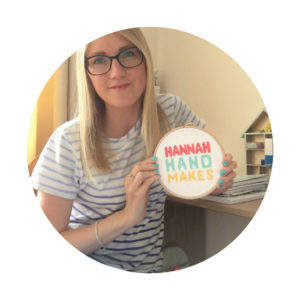 If you don’t know how to cross stitch yet you can visit my how to cross stitch guide for beginners. Next cut out your felt a little bigger than your eggs. 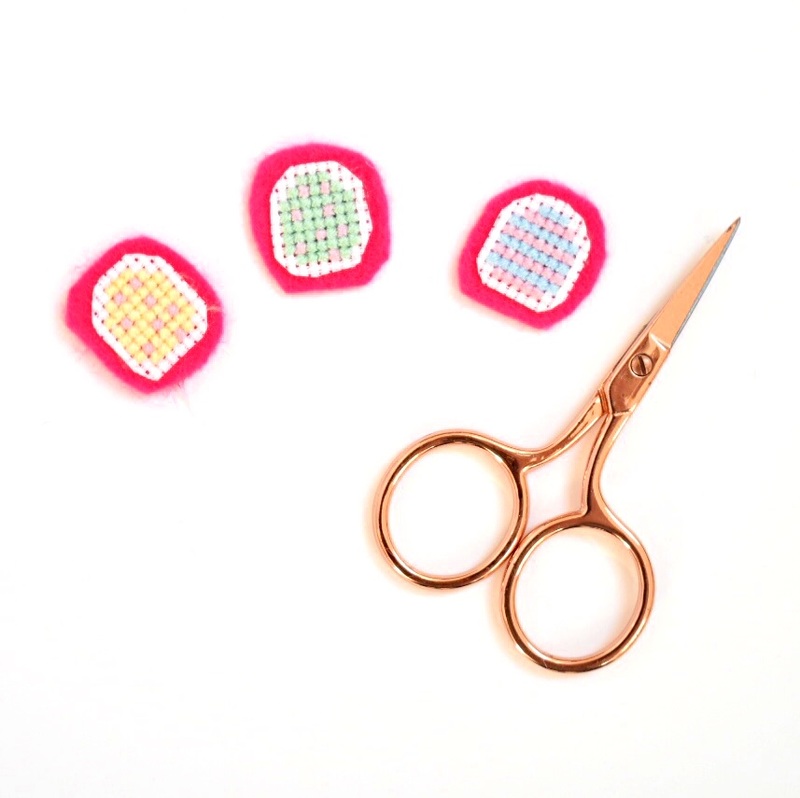 Just hold your egg shapes on the felt and cut around them. Then cut out enough felt to back all your eggs. 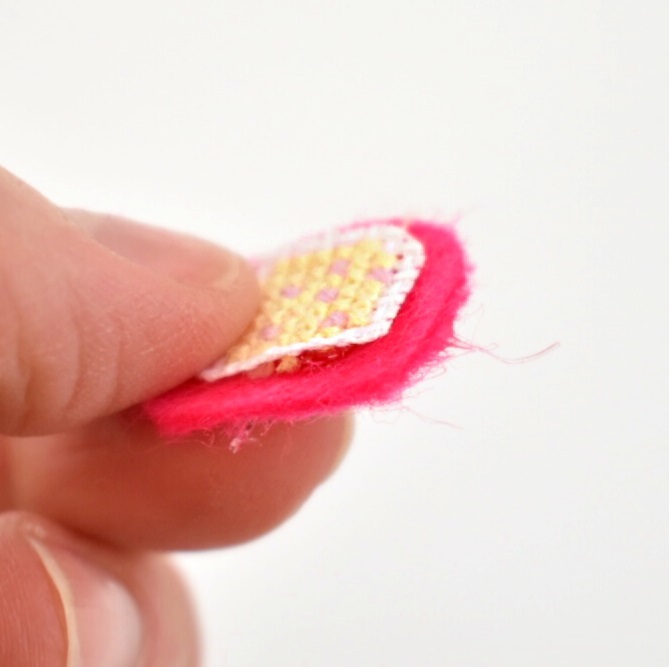 Then glue the felt on with a glue gun. 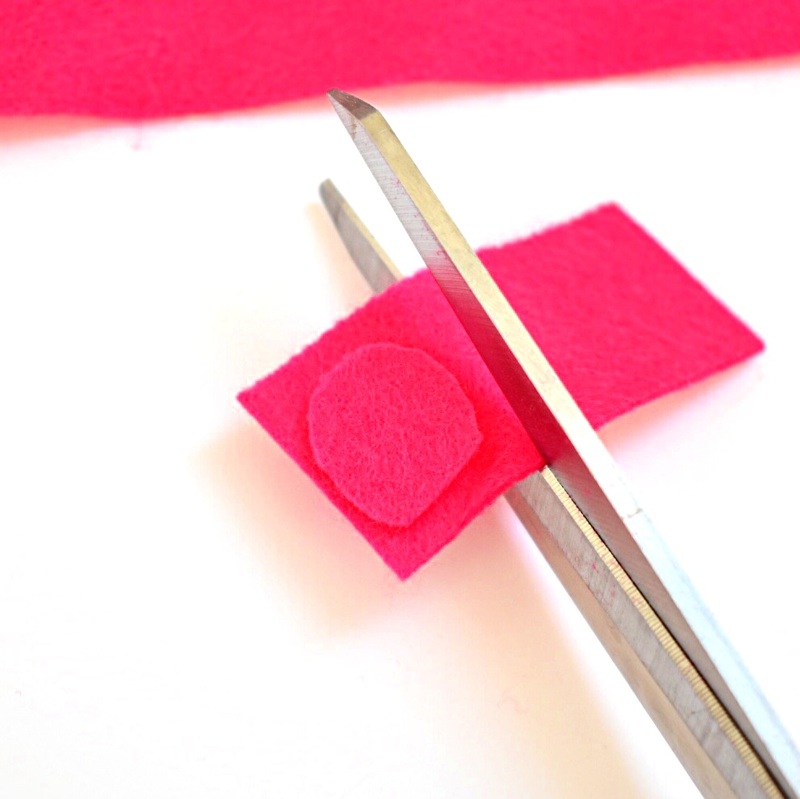 If you don’t have a glue gun then you can hold the piece of felt and aida together and backstitch around your egg catching the felt at the back so it is secure. 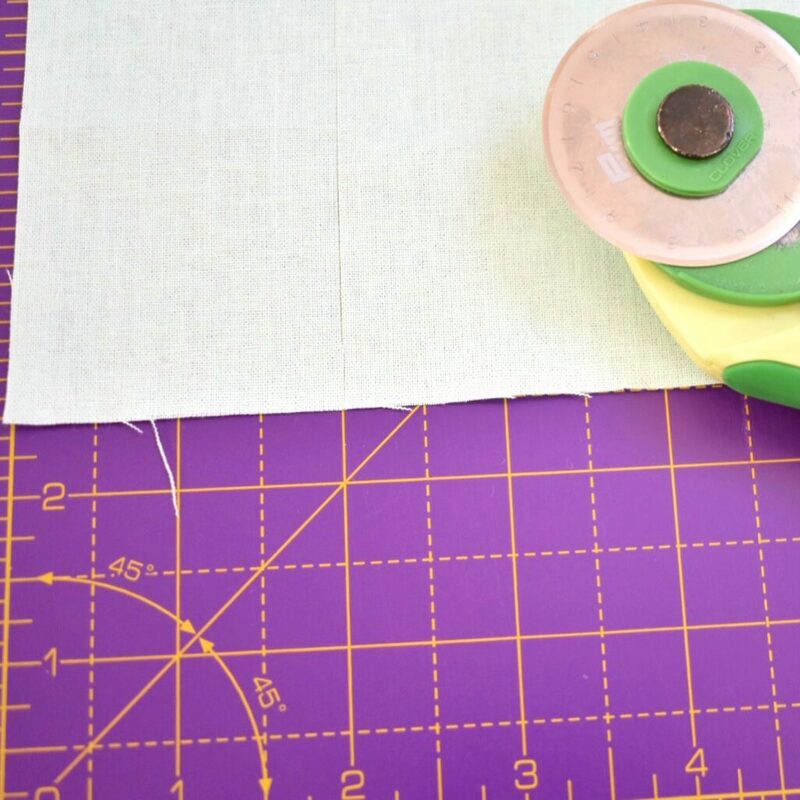 Cut your fabric into strips of 2 inches by 10 inches. I bought a pack of 10-inch square pieces of fabric so I got 5 strips for every square. 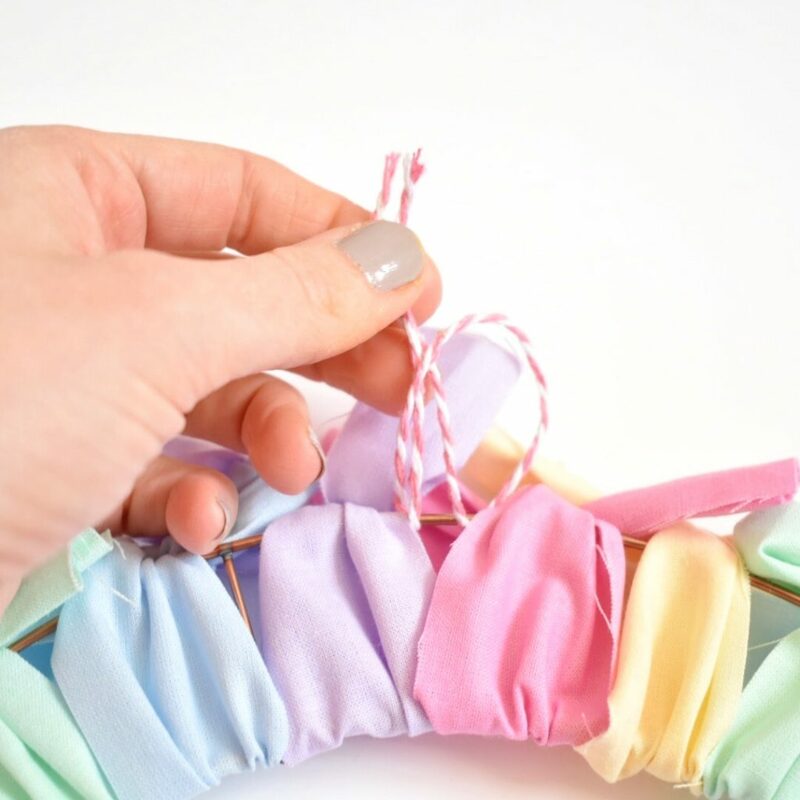 This is a great way to use fabric scraps too, so don’t worry if the strips aren’t the exact size. 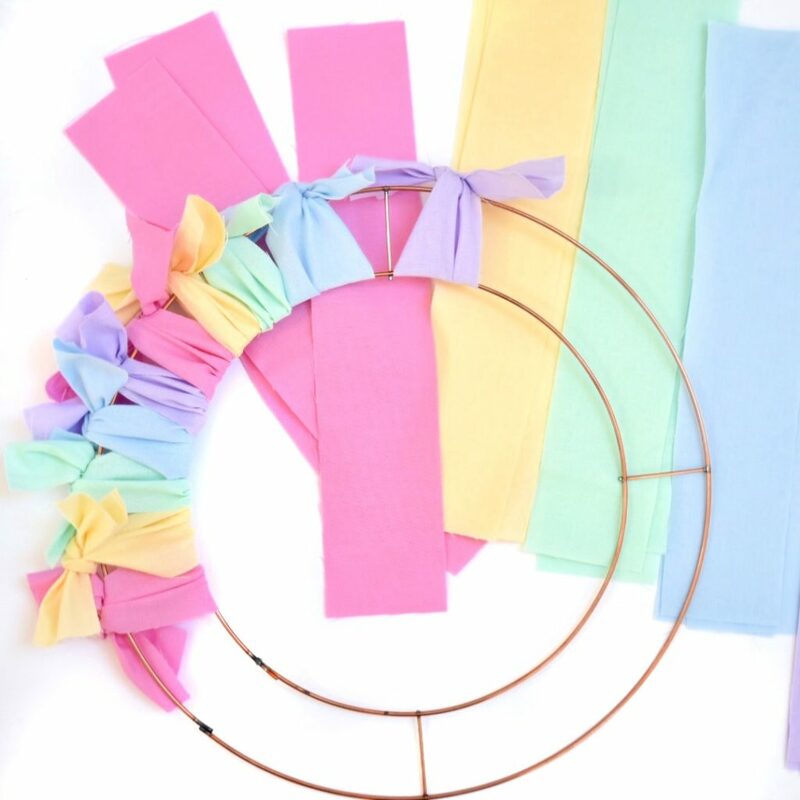 Now you tie each strip of fabric onto the ring. Before you start though I recommend sorting your fabric into an order that you want them on the ring. 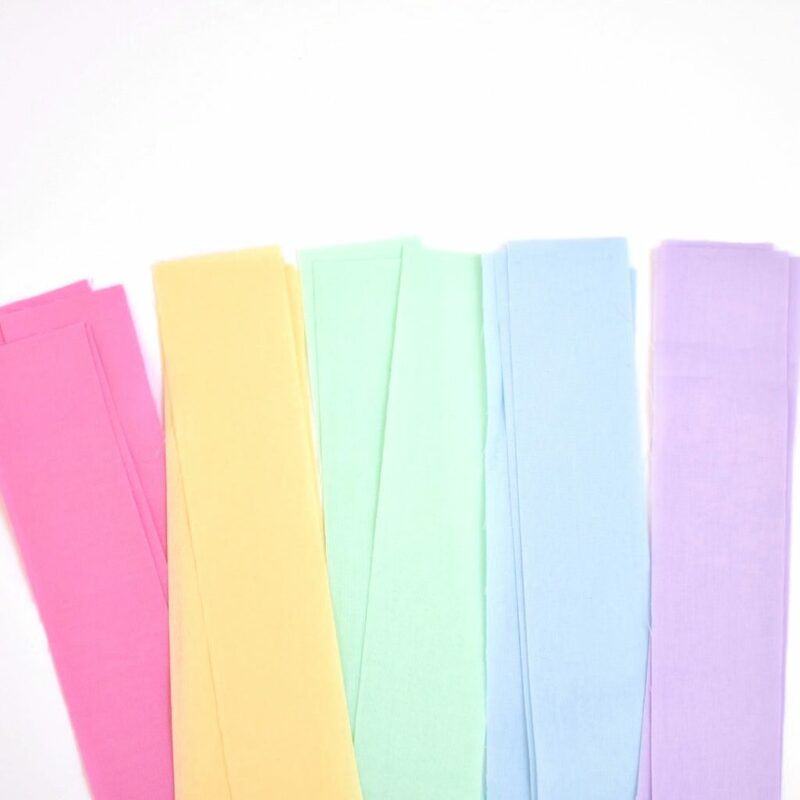 For example, my order is pink, yellow, green, blue, purple. Then just wrap it around the ring and tie a knot. Repeat until your ring is full of fabric! The template for the bunny is A4 and a little too big for this project. So I opened up a word document and added the bunny as an image and shrunk it to around half the size. Then to make the bunny for the oppoite side I just copied the image and flipped it. Then print them out. 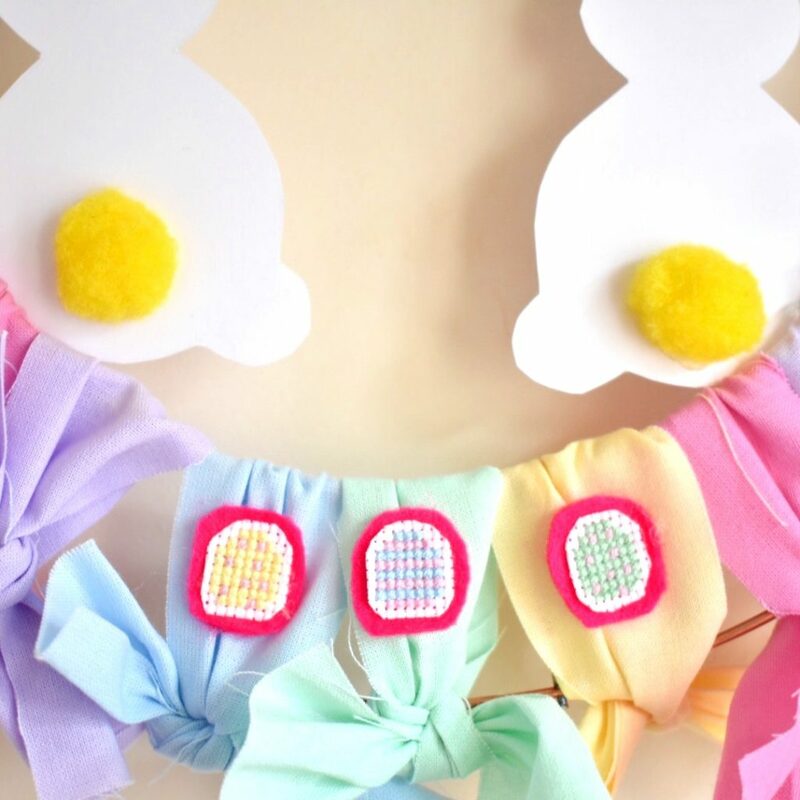 Cut out the templates of the bunnies and glue on the pom-pom tails. 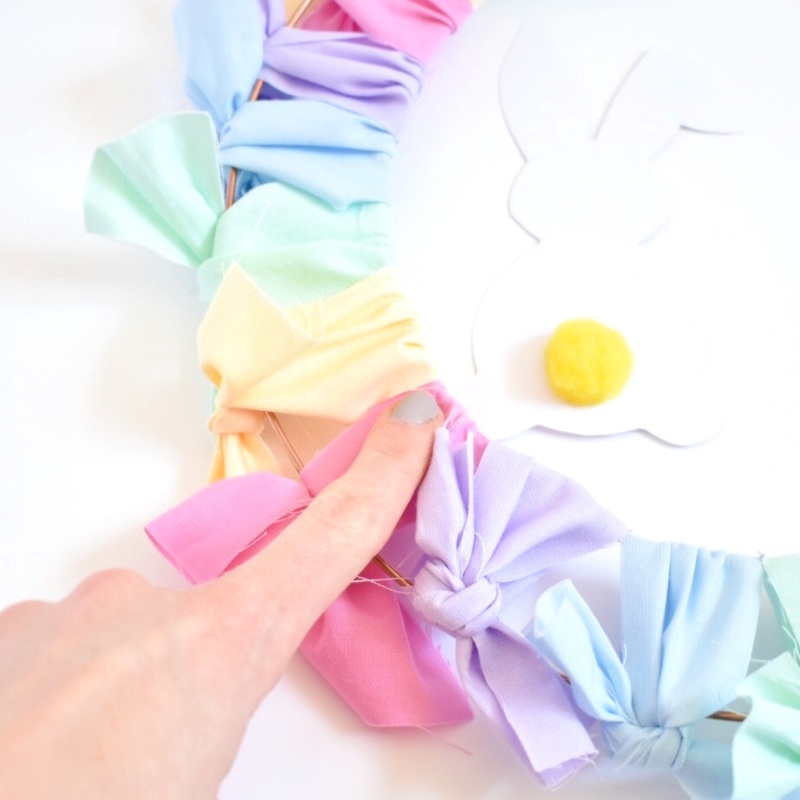 Then glue them onto the back of your Easter wreath (if you can identify a front and back). Just glue one of the feet to the back of one of the strips of fabric. 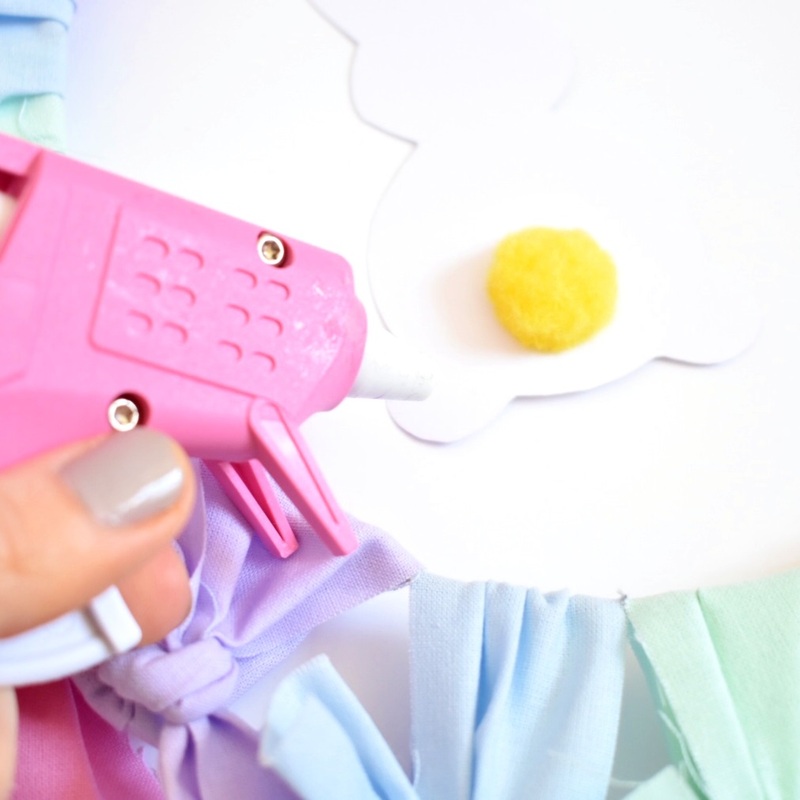 If you don’t have a glue gun then you can use tape or blue tac or even stitch it on. 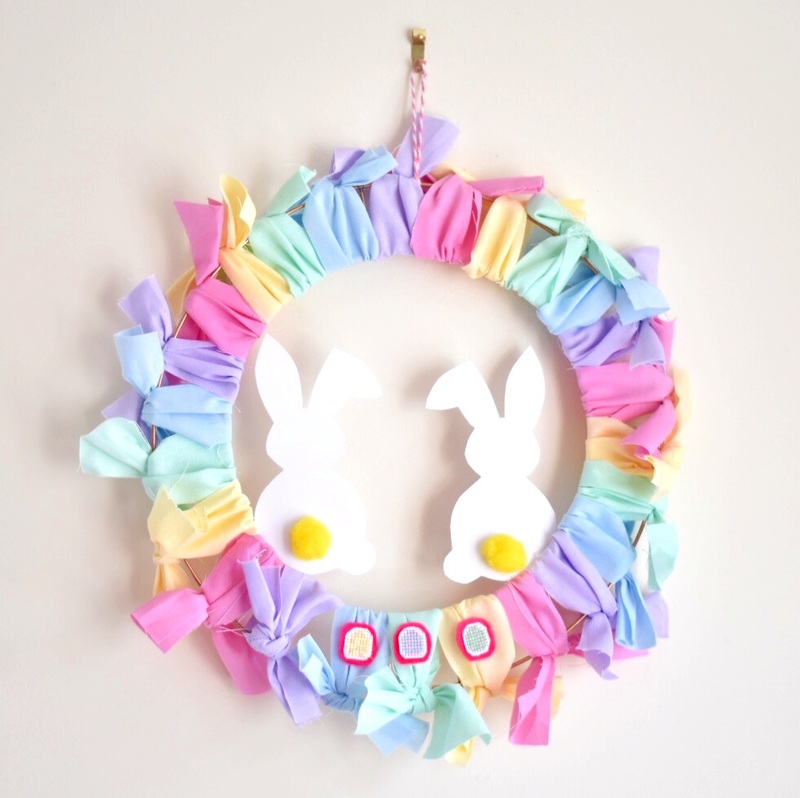 Now glue your eggs onto the front of your Easter wreath. 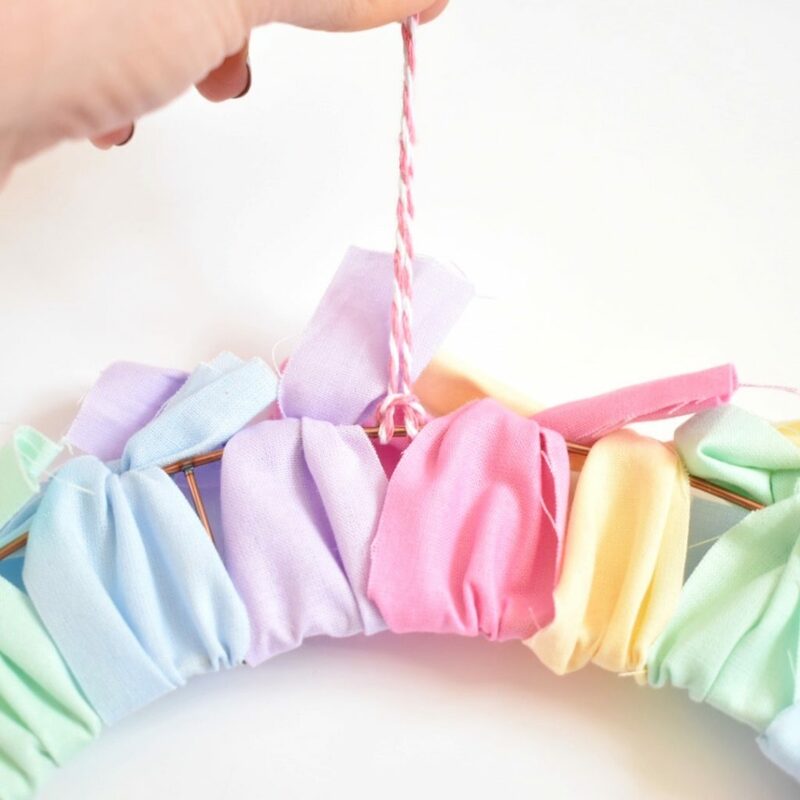 You could glue them all the way around on different strips of fabric or just bunch them together like I have. 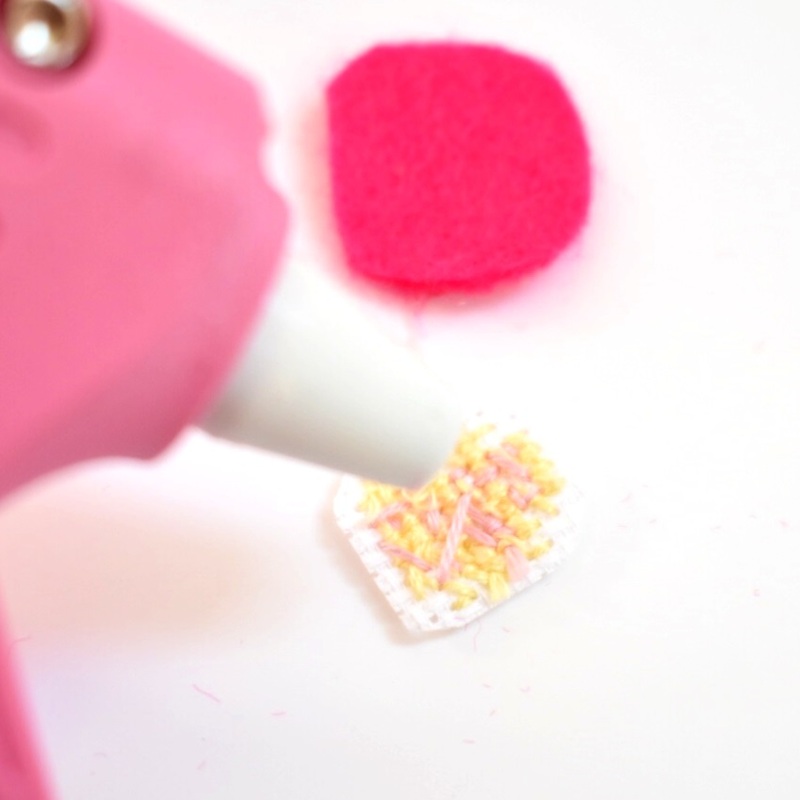 Again if you don’t have a glue gun just use something else that’s sticky or stitch them on. Step 8 – Hang it up! 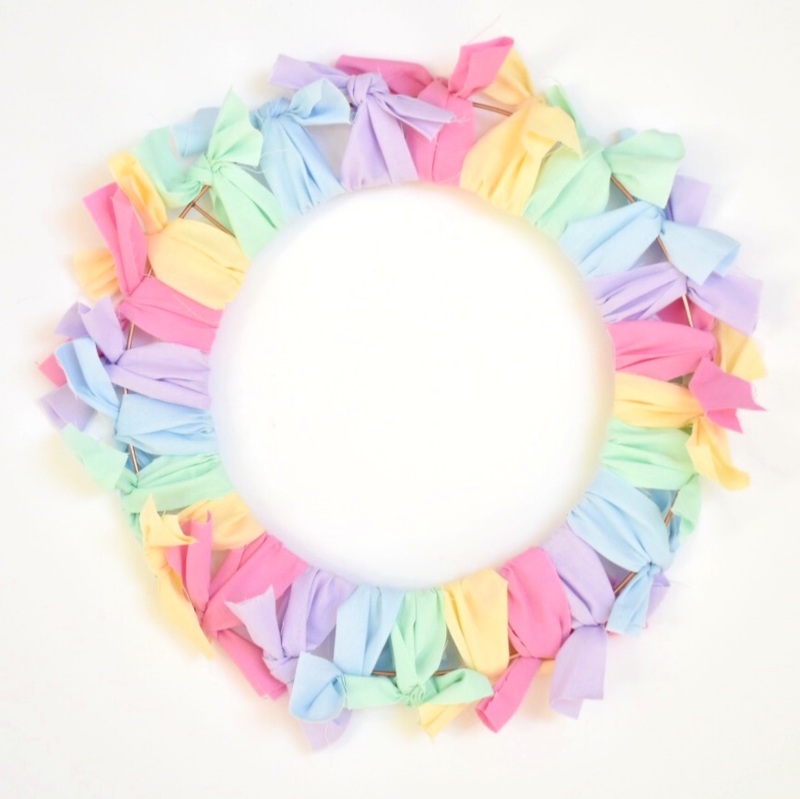 Finally just add some ribbon or twine to the top of your Easter wreath and hang it up! Put it on the back of a door, on the wall or use it as a decoration for and Easter party/ Easter egg hunt. 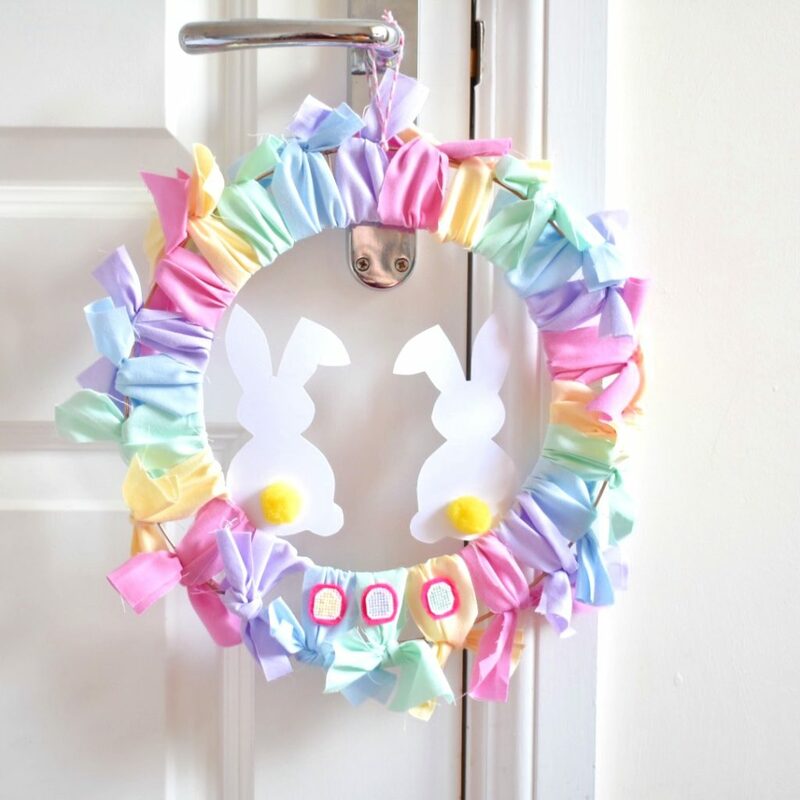 I hope you enjoyed this tutorial on how to make an easy DIY Easter wreath. If are struggling with any part of it why not join my Facebook group which has over 1000 other cross stitchers and crafters in and you can ask any questions you have in there. 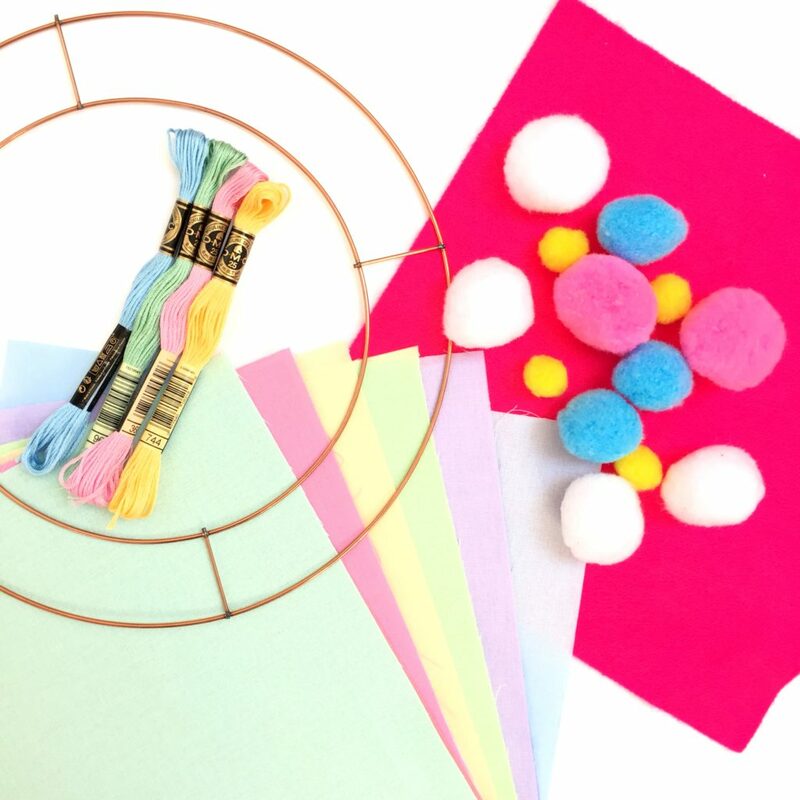 This project is quite kid friendly (minus the glue gun part obviously). Depending on their age your kids might enjoy tying on the strips of fabric (my 5 year old did). But you might want this project all to yourself! 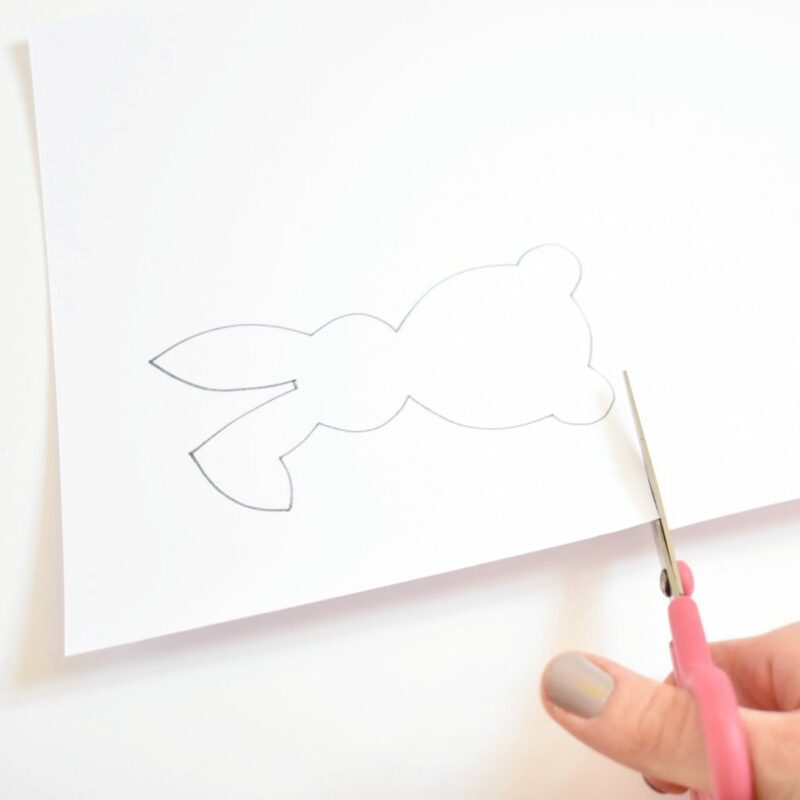 While I was cutting the bunnies and finishing off the wreath (the parts my kids couldn’t really help with) I printed the bunny template out full size, cut it out and stuck it to the wall. Then I gave my 2 year old a sheet of Easter themed stickers and told her that she had to get the stickers inside the bunny. She loved it!